From top left: Hand-thrown cup by Somewhere; various sizes of the Aalto Vase by Iittala; Japanese utensils by Kaico; and Kobenstyle’s 6-quart blue enamel casserole dish. Every Wednesday in Travel Loot, we find the best travel products to match our theme of the week. As part of our focus on global meals, we're keeping it simple with a global-inspired table for the minimalist traveler in you. A global table doesn't always mean brightly colored Mexican otomi textiles or patterned indigo napkins that you dip-dyed by hand in Burkina Faso (although those are fabulous too). 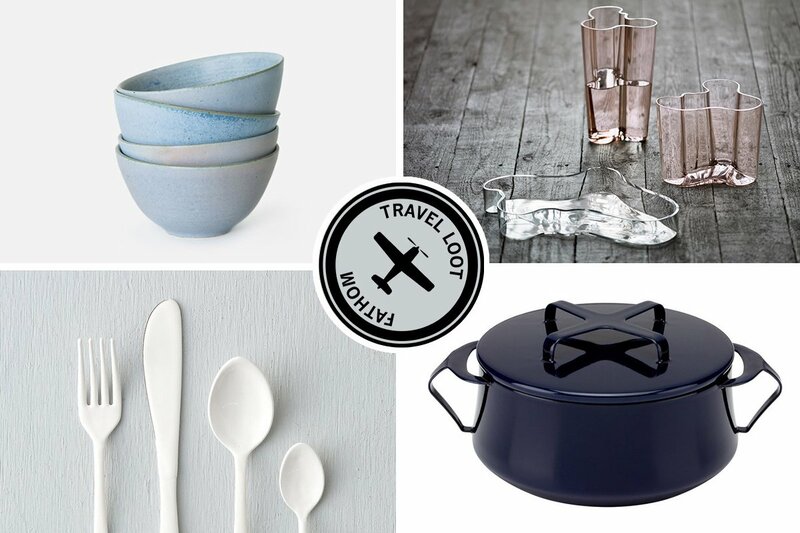 The Japanese, Danish, and Swedes are known for their clean, simple aesthetic, making their homeware lines an invaluable source for a minimalist traveler’s dream dinner table. Here are a few pieces I'm looking to add to my collection. The recently revived Kobenstyle cookware line is true to its Scandi roots with simple, but highly functional design. The ($130) can go from the stove to the table top, and the lid functions as a trivet. How's that for Scandinavian practicality? A staple in modern Scandinavian homes, the ($75) was created by Alvar Aalto in 1936 and is one of the region's most iconic designs. Keep things simple with a single branch of white orchids or brighten your table with a bunch of multi-colored tulips. Designed in the manner of a centuries-old woodcraft tradition from Slovenia called suha roba, the minimal curved (£35) is multifunctional. Use it to cook dinner and then to serve your favorite dishes to your favorite people. Even the easiest of meals will be taken to a new level with ($92). Each one is made by pressing vintage Indian woodblocks into porcelain and wiping it with blue ink. Made by local artisans in Bogotá, Somewhere's hand-thrown ($24) are basic and beautiful and uniquely glazed, giving each their own distinct look and feel. ($18) are made from white enamel coated steel. They're thermal-efficient and durable, a good thing, considering you'll want to keep them around forever. Tokyo-based designer Makoto Koizumi really broke the mold with this set. His is just as striking. Berit is the senior editor at Popupla. You can follow her on . She travels for the great hotels and expansive landscapes.